How does your home lose heat from windows? This is an important question to consider, especially during the colder fall, winter, and spring months when you’re heating your home and you’re especially conscious of how much you’re paying for your energy bills each month. Heat loss happens because warm air rises from heaters and heating vents, flowing towards different points in a room, including any windows. Some of the heated air that reaches your cold windows ends up getting lost, escaping through the unprotected glass. This costs you extra money in heating bills as you crank up the thermostat to compensate for the heat lost through your windows. In fact, up to 25 percent of your heated air can be lost through unprotected windows! If your windows are cracked, not sealed correctly, or drafty for any reason, then your heat loss percentage can climb even higher. How do you solve this problem? An option we recommend is a window insulation kit installation. We’ll explain what this is and how you can benefit! Many people find that replacing or repairing old, drafty windows is expensive and impractical; the truth is, not everyone can afford this option. Still, there’s no need for you to suffer from excessive cold drafts and decrease your indoor comfort because of drafty windows. Fortunately, the team at Total Window Service has a solution for you! We are constantly looking for ways to improve our services and help our customers save money. Our window insulation kit installation service is a low-cost alternative to expensive, cumbersome storm windows. What’s more, this solution can be placed (and when needed, can be removed) in just ten minutes! This process adds a clear film to your existing windows, creating a barrier against the outside cold and an effective way to keep your heated indoor air from escaping. Cascade System: This durable option can be placed around your window to last for several years. Double-sided Tape: This method offers maximum flexibility, since the film can easily be put into place or removed, as needed. The installation process is simple. We begin by thoroughly preparing the installation area; we clean the glass, removing all the dirt and dust that has gathered on the surfaces where the film is about to be installed. Next, we place double-sided tape around your window, and we stretch a clear film that seals your entire window. Once the film is in place, we shrink it using a hair dryer or heat gun. This final important step leaves your windows sparkling clear, with the film practically invisible. Total Window Service uses only quality 100 percent transparent plastic films from major industry brands, including 3M, Frost King, and Duck. We find that these trusted brands offer a superior product, leading to longer usage and a better experience for our customers! 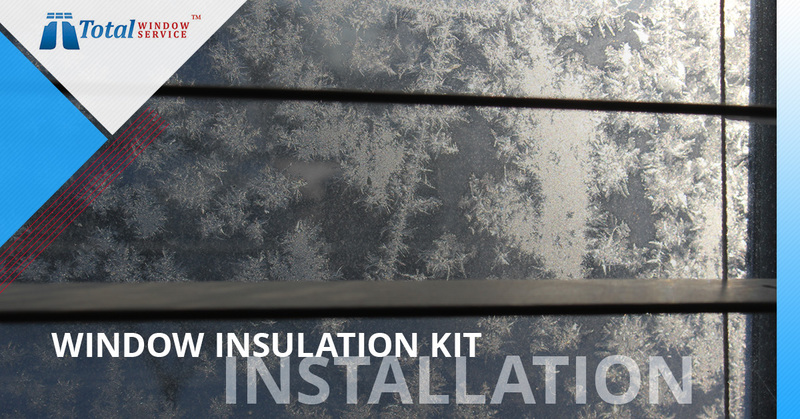 Let’s go over some questions and answers about our window insulation kit installation service. Question: Will double-sided tape take off paint from the wall or frame when it’s removed? Answer: No, unless the paint is already loose. Please note: The longer the tape is on the wall, the more that it adheres. Therefore, for easy removal we recommend having it taken off by the end of March. Question: Will your company remove the insulation film in the spring? Answer: Yes, we offer free removal if you order a window cleaning service with our company before the end of March. Question: Is the cost of the materials included in the price? Answer: Yes, we provide all the necessary materials and supplies for installation. Question: Can I provide my own material? Answer: Yes, if you prefer this option, you are welcome to provide your own material. It’s a low-cost alternative to installing storm windows. The process is quick and simple, accessible as an interior installation. The film is 100 percent clear plastic, letting you see outside without any obstructions. Options are available to suit your preferences; choose from the reusable cascade system or the removable double-sided tape option. You will no longer have to deal with cold chills from drafty old windows. Your home energy efficiency will increase. Your energy bills will decrease! As an added bonus, street dust will no longer come into your rooms through your windows. If you live in or near New York City, contact Total Window Service today for your free estimate!